Foundation repair, basement waterproofing, crawl space encapsulation and more! 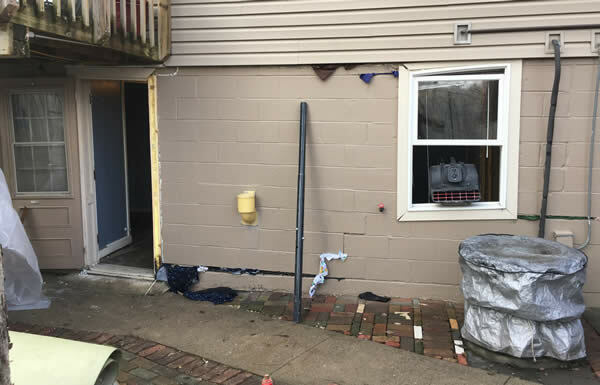 BDB Waterproofing offers the complete scope of foundation repair and settlement solutions that will repair any foundation settlement issue. Our proven foundation solutions are cost effective and are made of the finest materials. Check out BDB’s case study about how we repaired a sinking commercial building. The signs of a sinking foundation are not difficult to spot. Cracks in foundation walls or in drywall sheets are telltale signs of trouble. Stairstep-shaped cracks in brick or block mortar are always indications that your basement or foundation is shifting. Windows and doors stick and are difficult to open. Multiple popped-up nails appear in ceilings and walls. Large gaps in window and door frames. Spaces appear between windows and/or doors and surrounding trim. Floors start to settle and become uneven. Bowed or leaning basement walls. Cracks appear in basement walls. Why let the problems continue to cause your home and property further damage — damage that will not only cost you more money in repairs but dramatically lower the value of your property? BDB Waterproofing is your foundation repair and wall stabilization solution. BDB Waterproofing has more than 30 years of experience in repairing sinking and settling foundations. We know what works and what doesn’t. This is why we recommend our push pier system. Over time, the piers will actually be able to push your home back up to where it needs to be. A push pier system will be able to mechanically transfer the weight of your house (or business) to stable, suitable soils under your home. 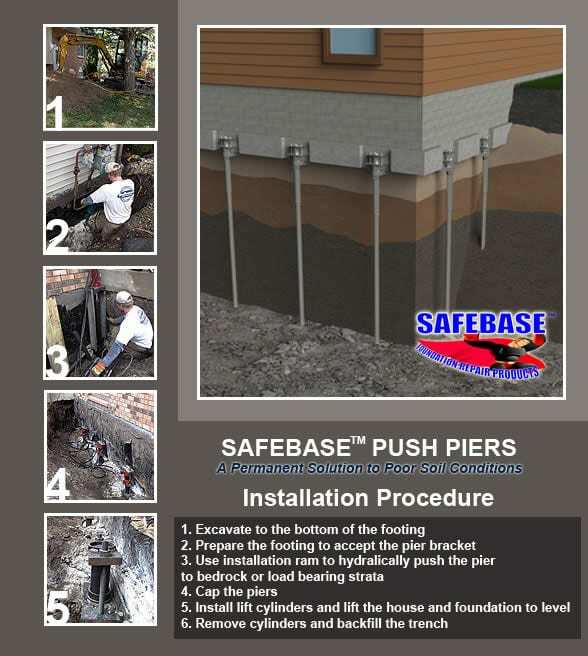 We use SafeBasements™ Push Piers that are hydraulically pushed into the ground to predetermined depths where those deep, suitable soils are found. These anchors are much less expensive than coring and concrete pier work. We attach to your home’s footing a series of SafeBasements™ Push Pier brackets of heavy, industrial-strength steel. High-pressure equipment hydraulically drives rugged steel piers down to solid bedrock or proper load-bearing strata. Keep in mind that this reinforcement is done below ground, so nothing is exposed. Also, each pier is individually anchored and tested for successful load-bearing. Finally, the weight of your home is carefully transferred from the original unstable soil to rock-solid piers so your home or commercial building is secure with the pier system permanently in place and hidden from view. Contact us today to schedule a free foundation repair estimate and inspection. Which Types of Foundation Cracks are More Serious?